The girl added: “After I have sat behind a computer all day, the last thing I want to do is sit behind the computer at home.” See, I can appreciate the sentiment: who would sit down nearly every day to randomly write her thoughts to nobody in particular. The reason why I do, is really quite simple: I enjoy it and it keeps me sane from daily business. One can chose to do this more privately in diaries, with the added bonus that you don’t have to censor yourself. That you are free to write what you want, when you feel like it. Today when I switched on the tv, a fairly new expe rience in this household, I came across the film: The Freedom Writers. It kind of seemed a Sister Act 2 remake without the singing or perhaps Michelle Pfeiffer’s Dangerous Minds, I only stopped because the kids/teenagers/ young people or whatever the PC term is these days were reading The Diary of Anne Frank. 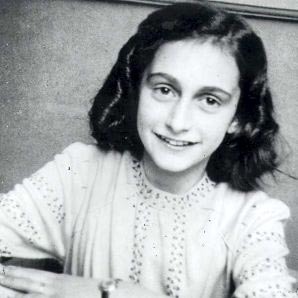 Anne Frank was a Dutch girl and being Dutch I took it for granted that we learned about her in school. So I am ashamed to say that until now – tonight I don’t think I really understood what an international symbol she and her diary have become. Ofcourse I have read her book, I have seen the plays, I have seen the films about her life but I guess it was the junxtaposition of this relatively recent piece of, for lack of a better word for it, high-culture (Second World War literature ) within modern, god what a horrendeous term, low-culture (2007 Hollywood film starring Hilary Swank), the latter being based on a real story, that I realised how incredible far Anne’s words still reach. She wanted to be a writer and she became a writer, the tragic but hopeful 15 year old, whose uncensored thoughts resonate with so many. The film also gave me something else, like my Saturday morning at the play centre; the sense that there really are different ways of living. Depending on who you are and what your interests are these are different for us all. I cannot imagine it but some people like making the numbers work or get a kick out of massive profits. There are people out there whose life is complete with that. Like there are people out there who teach, or manage accounts or fix cars or mend people’s bodies or help us at the supermarket till or play football or paint houses, or chose clothes for models, or who design the clothes even, or the ones who protect other people in warzones. As long as they are happy with their lives and don’t hurt others (ok, granted: the warzone one is dubious) who are we to judge them on what they do? Whether it is beneath our standard or too stuck up? Whether it is too pretentious or just too pathetic or in other words: too sad? Back on my crosscroad, I might not yet know where to go but I do know life is too short to be unhappy. So if currently the only way to counterbalance my days are by writing this for you who reads it, so be it. I write because it makes me happy, I write because it proves that at the very least: my thoughts are still free. No Poor Man’s Sandra B.
it’s a shame that people are so exhausted for life at the end of the day. Go forth and express! No matter how bad a day you’ve had.